As this was the first time I had made a genuine pickling brine, as opposed to using water and salt and then bottling in olive oil to preserve, I thought that a bit of web research was necessary. Essentially, I was looking for commonalities amongst ingredients and technique and then applying them to what I thought would best suit my Jalapenos. The almost universal rule seemed to use a 50/50 solution of water and vinegar. Any vinegar except balsamic would be applicable. So that was easy. Next step was to work out the ratio of salt and sugar, and this varied. Some recipes had more sugar and less salt by ratio or vice versa. I decided on a tablespoon of each per four cups of solution. The list of additives came next and this could pretty much be summed up by ‘anything you want’ so, as I was pickling chillies, I thought about curry or Mexican ingredients. I chose marjoram as the herb because I couldn’t see thyme or rosemary in the flavours and a few recipes had mentioned it. So here is the recipe, untasted as yet but I suppose experimenting with this stuff is half the fun. The brine quantity is based on what would cover the chillis in the jar I had put them in. Combine everything in a saucepan and bring to the boil. Allow to simmer for 20-30 minutes and leave to cool. 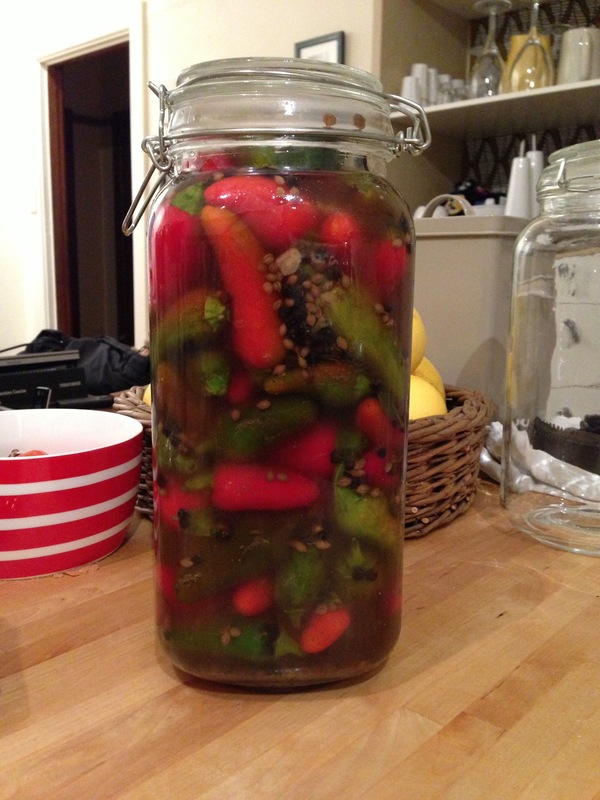 When warm to the touch, pour the brine over the chillies (in your sterilised jar) to cover. Russell is the inaugural guest blogger on The Buzz. The following clip is dedicated to Russell and Lisa’s garden journey. Note: the feature image is a photo of Russell and Lisa’s beautiful, productive garden in Melbourne’s northern suburbs. Russell says, “Basically Lisa and I have become a little obsessed with the idea of urban sustainability and have turned a more or less empty backyard in Coburg into an obstacle course for the dogs with a fledgling orchard, raised veggie beds and a water tank. The only concession to being fully productive is a native garden (though that also houses a cherry tree and cauliflowers at the moment) and a small silver birch copse to provide a bit of shade. It is the first time we have been able to transform a garden into what we want rather than just a few little veggie beds.